Like most Start screen apps, the browser app on your Windows 8 tablet hides its menus. That lets you concentrate on the picture rather than the frame. When you need the menus, you can reveal them using the same trick that summons the menus from any Start screen app: Just slide your finger inward from the screen’s top or bottom edges. As you slide your finger, it drags the menu into view, snapping it along the screen’s top or bottom edges. 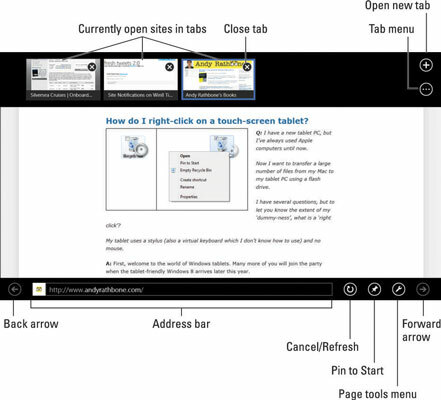 Back arrow: Tap this to revisit your previously viewed web page. Cancel/Refresh: As you view a site, this becomes a Refresh button; tap it to reload the page, retrieving the latest content. The Refresh button turns into a Cancel button while a web page loads; if the site takes too long to load, tap the Cancel button to stop trying to load the sluggish site. Pin to Start: Tap this to pin the site’s name and icon to your Start menu. Doing so not only makes for easier launching from the Start screen but also makes it easier to launch from within the browser itself, as I explain in the next section. Forward arrow: After clicking the Back arrow to revisit a site, click the Forward arrow to move back to the site you left. Tabbed sites: Along the top edge, the browser lists other sites currently open in your browser. To revisit one, tap it. To remove one from the list, tap the X in its upper-right corner. Tab menu: Dedicated to the tabbed sites shown on the top row, this icon brings a pop-up menu with two options: Close tabs, which closes all the open tabs, and New InPrivate tab, which opens a new tab for browsing in private (covered in the Browsing in Private sidebar, later in this chapter). The Start screen browser may look lightweight, but it’s actually fairly full-featured, providing everything you need for casual browsing. The browser lets you open several sites simultaneously, each in its own tab. There’s really no need to close Internet Explorer or any other Start screen app. They’re designed to stay open constantly, letting you switch between them as needed.